For Heidi Hutner who inspired this scrutiny. Scientists in Alaska are investigating whether local seals are being sickened by radiation from Japan’s crippled Fukushima nuclear plant. 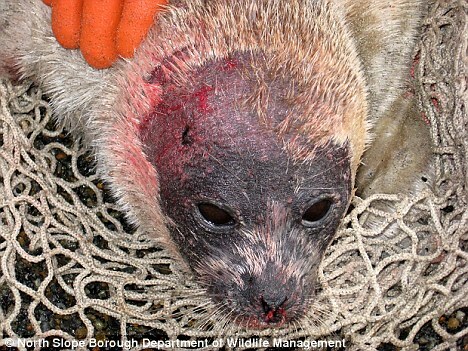 Scores of ring seals have washed up on Alaska’s Arctic coastline since July, suffering or killed by a mysterious disease marked by bleeding lesions on the hind flippers, irritated skin around the nose and eyes and patchy hair loss on the animals’ fur coats. This is the second day of 2012. The way I live my life is causing great pain and injury to many beings. I am hoping that the trajectory of our lives will change on 12/20/2012. This will only happen if we approach it deliberately. Here is a first step. It is so simple and ordinary an act; it is a leap. I have to disentangle from whatever I recognize causes harm and injury to the earth. Why would I allow myself to continue to live in ways that agonize the beings of this world? The seals are in great anguish. There are no painkillers for them. Little ones are in agony. Some have died. Who was with them? Who comforted the mothers? The cause may be radiation from Fukushima. I have never advocated for nuclear energy or weapons. But the life I live and the privileges I accept, are congruent with nuclear energy. I have to begin to turn away from the life style that harms others so extremely. Seals have lives. We have life styles. The discrepancy is intolerable. I have to disentangle from the minds that can tolerate others suffering such pain or suffering for the sake of economic or military gain or …. I have to recognize and accept that they are mad. It is no longer important to know why they are mad. It is essential to know they are crazed and to step away from the circle of their constructions. Every day another technological, economic, political, social event, activity or invention violently diminishes or harms life. Our lives disappear and what is substituted is a manufactured reality, increasingly the domain of the criminally insane. Spirit disappears. It cannot exist in the unnatural realm. To do so, perhaps, would be to accept our life styles. Conventional wisdom says that I have to acquiesce to the contemporary world, to how things are. It says, I have to submit in order to be effective, to create change, in order to survive. This is what you have to do to survive, it says, kindly. This is not true. It is only true so long as we agree to live this way. Spirit was the source of different lives. Spirit shows us other ways. Living each day and moment in a dialogue with spirit, responding as spirit would have us respond on behalf of Creation, is a Way. We once were one with spirit. Each of us lived within the sacred conversation. We had the means and the understanding. That relationship was once intimate and continuous. No one was denied it. No one was outside it. We breathed it and it rained upon us. It was a great light. It was the comfort of being immersed in starry darkness. A great distortion came into our midst and separated the human from spirit. The moments of vision that we sometimes experience and call extraordinary reality, and that are so brilliant that a single instance can sustain us for a lifetime, are merely sightings through pinholes to the radiant world we once inhabited. It was once this way. Then listening was forbidden. Then it was mocked. Then it was overridden. Spirit speaks to us when we open to it. The way to disentangle from what causes such great harm and pain is to reconnect. A true and ordinary life is entirely connected with spirit that benevolently considers and praises all beings. Be with me as words enter the world through the invisible conduit that has always served creation and is sufficient. Image: Occupy Wall Street or Occupy Los Angeles or Occupy Everywhere. There is no microphone. Someone, however, has a megaphone. A simple device. She, or he, says a short sentence. The crowd repeats it and amplifies it a thousand fold. Not only does everyone know what is being said, but everyone passes the words through their bodies. In this way, every word is understood deeply, is taken in, and what is being spoken is vital for everyone. Spirit speaks. Spirit speaks when we open to it. In this moment, something is being spoken that I did not expect. Spirit is speaking and I am passing it through my body as I write the words on the page. I am speaking them aloud as I type. Words doubly etched. An antidote for alienation. Stay with me. If you like, repeat what matters to you. We are in a practice, an exercise that undermines possessions. The words are entering. They are entering in their own time. I listen. More importantly I take the words into me. I want to understand and offer myself to be altered. Of course, I have to trust these are spirit’s words, not my own or anyone else’s. Certainly, I can’t be sure., but they are surprising me. What is being communicated is simple and is startling. I am coming to a standstill as if yielding to a wordless understanding that is beyond me. There is nothing I can do to invite it closer. We will see whether or not this comes to a conclusion. We will see whether the entire understanding will emerge roundly. Spirit speaks. Because we have opened to it. This is so simple, I cannot pretend I am inventing it. I am afraid that this is so simple, and so familiar, that I will not be able to meet it. That I will not turn the 180 degrees that is required to meet it at this very moment. I am afraid that I will ignore it. I am afraid I will say it is obvious and banal. The challenge is to recognize this simple and yet enormous truth. I am afraid I will not understand that this is important enough to turn my entire life around. To turn my life around entirely, here and now. Is it possible that the full realization of my life depends, now, on the simple gesture of turning my back so I face a life that does no harm. Living with spirit is something we have known. It was of us but we separated from it. It became an idea and it was no longer a Way. We stopped living accordingly. Ideas that we do not live, do not matter. These words are insisting on being a Way again. I was on the way to writing something else. But these words began coming and insisting themselves. This may be a reliable sign. To know serves us only when knowing is alive, when we live accordingly. If something strikes you, let the words will pass through you also as they are passing through me. Kabbalah says that Spirit descends into the world. A great light or rain or wind arrives from elsewhere. Kabbalah says that we also rise up to meet the holy. The way to disentangle from what causes pain is to reconnect with spirit. Spirit comes when we open to it and live within it as if it is the air. Spirit exists and is entirely benevolent. Beauty and Heart are one and interchangeable in the Presence. The true and ordinary life requires us to be aligned, at each moment, with spirit, with what does no harm. I insist that I will find ways to sustain and be sustained as I return to the real world that was never constructed of others’ pain. I can do this. We can do this. A new step each day away from what causes such pain. Step by step, we can do this. This is what the Dine call the Beauty way. To Consider 2012: A note to you. WHY AM I WRITING A BLOG?